The weather will continue to be ‘rainy’ for the remainder of this vacation. Perhaps with the exception of tomorrow, when it’s expected to stay (at least) dry. C. will use that day to climb the Stelvio from Bormio and the Gavia from Ponte di Legno. Sunday there is the ‘Mapei Day‘ which means the Stelvio will be closed to motorized traffic and there will be all sorts of sporting events (roller blading, running, cycling). Would be nice, but the weather looks really bad for that day. 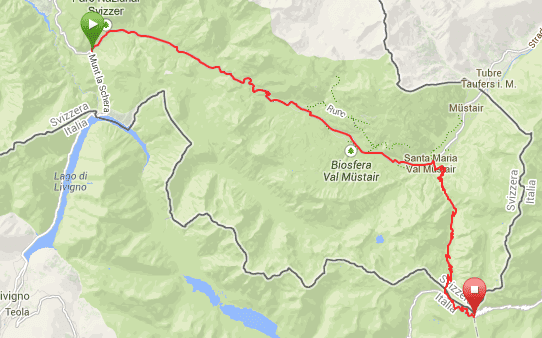 Because he already climbed the Foscagno, he transferred to ‘Punt la Drossa’ by car. Good thing too, because the Swiss have closed the tunnel ‘Munt la Schera’ for bicyclists – you could use it before, but no longer. From Punt la Drossa, the remainder of the Ofenpas is only around 9.5 kilometers long and while the final part of this stretch is interesting, C. mainly used it to warm up his muscles, although the descent to Santa Maria was longer than the climb. In Santa Maria they had a coffee at the Hotel Stelvio and after that he started the climb of the Umbrail. This climb is actually not that easy (profile) but it is steady – the percentages fluctuate between 7 and 14, with an average of 8.5. Because it’s only 13.2 kilometers long, it doesn’t get a high ranking at climbbybike.com, but it is definitely ‘demanding’. The 2 kilometer ‘unpaved’ stretch was actually no worse than a bad paved (average) road in Belgium. Tons of gravel have been pressed into the mud by the passing traffic and you have to watch out where you’re going, but it’s not too bad. Once he reached the top, he couldn’t resist the temptation and added the last 3 (steep) kilometers to reach the top of the Stelvio. Once there, it started to rain quite heavily and after that, the clouds rolled in and spoiled the view (down the more famous side). During the descent back to Bormio (by car), C. had a good look at the complete climb and it looked promising for tomorrow! Total trip: 40.0 km / 2,165 altimeters.